At Davidson College academic leaders and instructional designers have been collaborating to test new approaches to pedagogy and course content to turn the tide on success in introductory science courses. In biology, faculty have developed a new, two-semester introductory course that uses the Echo360 platform to create a flipped classroom. Before class, students review recorded mini-lectures, and come to class ready to participate in group discussion—responding to in-class polls or collaborating in small groups on hands-on projects. When faculty do lecture, students are able to view the presentation slides from their own tablet, computer, or mobile device and take time-synched notes; those notes and the lecture are available for them to revisit any time. They’re interacting throughout class, responding to polling questions and flagging content when they’re confused. High quality video capture and student engagement tools have enabled faculty to create an active learning environment, that’s highly responsive to the needs of the student. 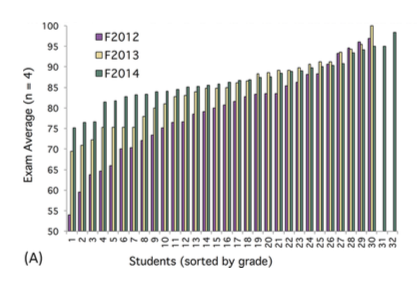 In 2012, before using Echo360, roughly half (47%) of students averaged below 80% on exams. After using Echo360 for one year, average exam grades improved and only a quarter (26%) of students averaged below 80%. In the second year, only 9% of the class averaged below 80%, representing a 38% increase in average exam scores. By implementing active learning methods and Echo360 as the technology platform, the number of students who became biology majors increased. 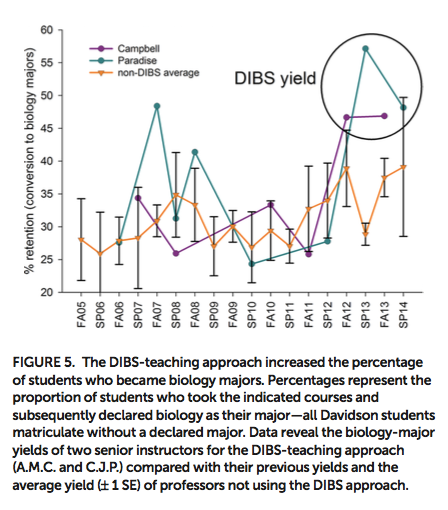 The percentages in the chart below represent the proportion of students who took the introductory courses, had success, and subsequently declared biology as their major. In addition to more students declaring biology as their major, when surveyed, students also reported increased engagement throughout the semester and said Echo360 was very helpful for their studies. Davidson College continues to study the impact of active learning and Echo360 in the classroom. One of the stakeholders in the research, Kyosung Koo, an Instructional Technologist at Davidson College, will present at our upcoming active learning conference on April TK, 2017, in Dallas, Texas.